Day 1 CrossFit-less. Jane and the shooting. Last night Todd’s sister randomly offered us tickets to see Jane Goodall give a talk at CU. Not gonna lie. It took me a moment (and Google) to remember who Jane Goodall is. Oh yeah, she’s the chimpanzee one. The gorilla one was Sigourney Weaver. Oops! I mean Dian Fossey. Well I love animals so why not? Watching thousands of people fill the stadium I couldn’t think of anything I would talk about that would draw a crowd like that. She’s so popular they had to move her presentation from Macky Auditorium which seats 2,052 to the Coors Event Center stadium which seats 11,064. I don’t usually have the attention span to watch someone talk for an hour before I start wondering how fun it would be to run the stadium stairs. But I am glad I didn’t miss this. As a little girl I had a book of nursery rhymes with a drawing of Mother Goose on the front cover. 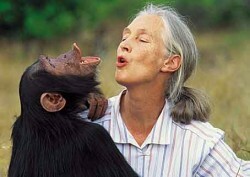 Jane Goodall would make an amazing Mother Goose. Gentle and soft spoken with that proper British accent. She whispered her way through the tale of her 55 year study of the social behaviors of wild chimpanzees like a grandmother reading Peter Pan. By the end I realized I will soon need to include her in my Most Inspiring People posts. Save the chimpanzees! Unbelievable what she was able to accomplish not only as a woman in a field of science during the sixties but as a white British woman in Africa. Talk about breaking down walls! As a current UN Messenger of Peace she also talked a lot about the world and where it is going. Sobering discussion just hours after the Oregon Community College shooting, the fourth of its kind since August and the 74th! since Sandy Hook. After speaking with children from many different countries Goodall said a recurring theme had emerged. Younger generations believe we have destroyed our planet and promoted war and violence past the point of recovery. Pretty bleak outlook from a bunch of 10 year olds. That we’ve ruined the world and nothing will save it? Where do you suppose they get that idea from? [Sad face]. What will the 10 year olds of the world turn out to be like without hope? But she challenged them. What if there is still a window and what if that window is right now? What if it is not too late? What if the fate of the world is still in our hands? I have to admit. I don’t like to follow the news. It isn’t because I am not interested in what is going on. It is because it is disturbing, depressing, and scary. I am much happier in my CrossFit bubble where my biggest concern is whether or not I will make it through the next workout with my body and pride in tact. But I also realize that burying my head in the sand is as good as contributing to the problems of the world. Somebody told me once: If a train is coming toward you but you don’t choose to go one way or the other (or worse if you don’t even notice) the train wins. Everyone needs to figure out what their role is in the overall mess and how to be even just a small part of some greater solution. Message to the students, friends, and families at Umpqua Community College: I am so sorry for what you have been through and what you are going through. I don’t understand how such a thing as walking into a school and shooting the future of our world has become an epidemic. I will be thinking of you and your families during this difficult time. Workout: P90x Cardio. I found the yoga warm-up to be harder than the workout and missed having people around. Not a very satisfying start.